Are you tired of sugar cookies that turn out so-so? 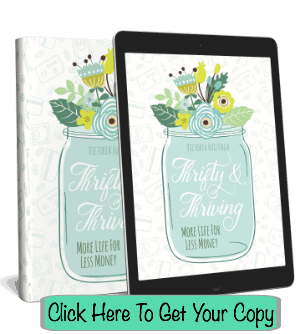 Do you want to know what you are doing wrong? 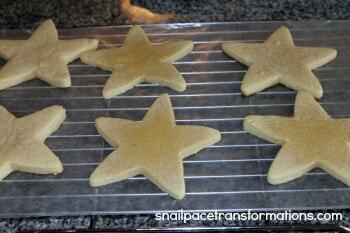 How do you bake fabulous sugar cookies every time? Sugar cookies that melt in your mouth. Sugar cookies your friends and family rave about and that will sell out quickly at your child’s next bake sale fundraiser. 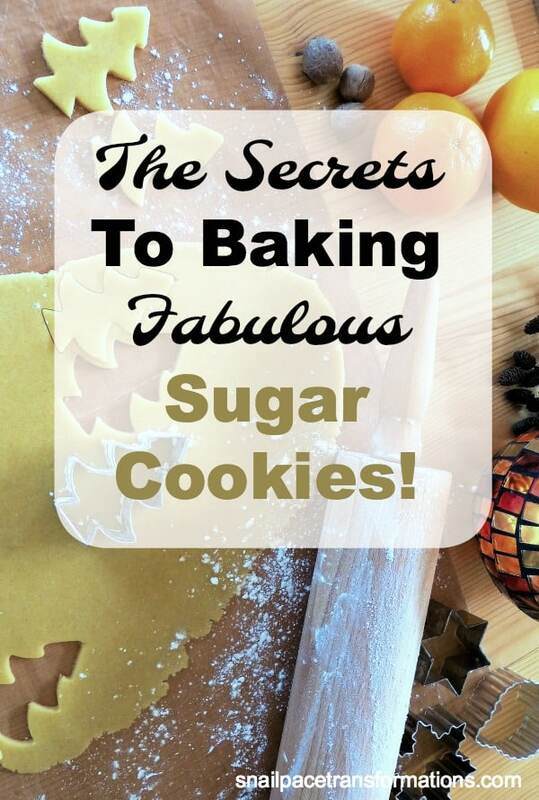 Well, it isn’t all that hard when you follow this super simple list of tips for fabulous sugar cookies. Every year when my children were little, I held an annual sugar cookie party. Some were small and some were large, but they have all been a tonne of fun. I am locally famous for the sugar cookies I bake for the party. Moms have been known to leave my party begging to take extras. 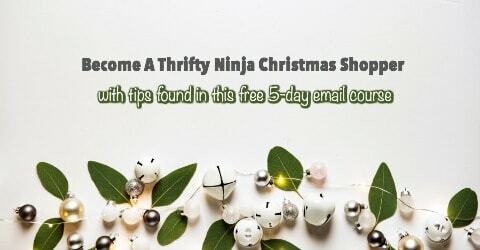 People love them so much that a few have started asking me if they can buy them from me (I have not sold any as I just can’t put a price on them). Here is a secret–my recipe is straight out of the Mrs. Field’s Cookie Cookbook with no alterations done to the ingredients at all. However, I don’t follow the directions to the letter and I have learned a few tips through trial and error that make them extra tasty. 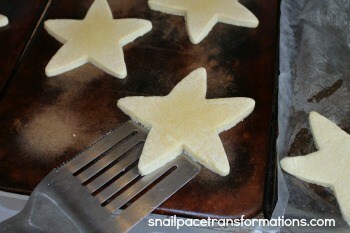 Today I am inviting you into my kitchen to show you my secrets of baking fabulous sugar cookies. If you are going to double or triple (or in my case for the party make a batch times ten), you need to sit down and write out the new amounts of ingredients you will need and check it twice to make sure you did your calculations right. Step away from the margarine, bleached flour, and imitation vanilla. 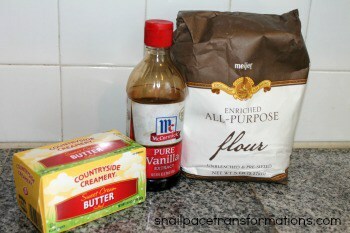 Replace them with real butter, unbleached flour, and 100% real vanilla. This does not make a difference to the taste, but it will make a noticeable difference to the look of your cookies. 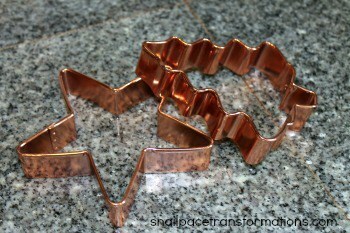 I was blessed to have someone give me some large copper cookie cutters. My star is similar to this one on Amazon. These cookie cutters are not cheap, but the quality is fantastic. They never stick to the dough, make a clean cut, wash well, and I have had them over ten years and they have kept their shape perfectly. Silver metal ones are my second favorite, and plastic ones are my least favorite. 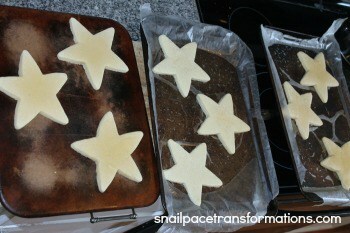 For years I used inexpensive cookie sheets lined with wax paper (yes, wax—not parchment paper. Although parchment works even better, it costs more) I would oil the sheet, stick the wax paper to it, and then lightly oil the wax paper. I still use two of these cookies sheets this way when I am making a big batch and want to fill the oven to capacity with cookies so I can finish faster. 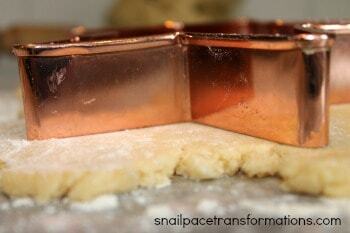 My favorite cookie sheets now though are my stoneware cookie sheets from Pampered Chef. No need to line them, just lightly grease them and never have a black bottom cookie again. Sugar cookies take planning. 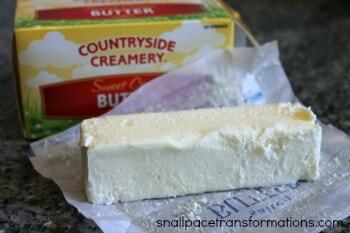 You have to make sure you take your butter out to soften at least four hours ahead of time. I try to take it out the night before so I can bake in the morning, or I take the butter out first thing in the morning so that I can bake in the afternoon. I mix my ingredients to a crumble using my handheld mixer and then use my freshly cleaned hands to squeeze the dough into one giant ball. Psst…after burning out the motors of several different brands of cheap handheld mixer I finally splurged on a Kitchen Aid 7 speed handheld mixer and I so wish I had made the splurge sooner. It powers through the biggest batches of cookie dough with ease. Often when I double or triple the recipe the dough turns out a bit dry, I fix this by adding an extra egg. Every sugar cookie recipe out there tells you to let the dough sit for an hour before making it. I DON’T. I find that by skipping this step, I get softer cookies. Only roll out enough dough to cut a cookie or two as sugar cookie dough is a lot like pie crust; you play with it too much and you end up with hard cookies. If you want soft and chewy cookies, then roll out your dough a little on the thick side. If you want crisp cookies, then roll the dough out until it is a bit on the thin side. 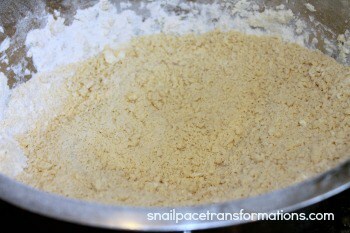 Whatever your liking just make sure the whole batch is consistent, otherwise baking it to perfection will be difficult. 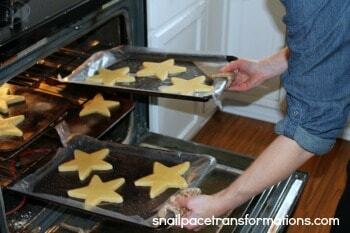 Do not slide a single cookie into your oven until the stove has reached the desired temperature on the recipe. You cannot wing it when it comes to sugar cookies. One minute too late and they are hard as rocks. Too early and they crumble and go gooey in the middle. If you are using both racks of your oven at once, make sure to set the timer to go off halfway through the cooking time so that you can rotate the cookies for even cooking. Perfectly baked sugar cookies have just a touch of golden brown around the edges. 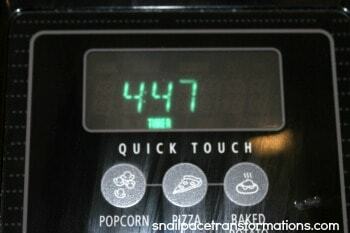 Knowing how long your oven takes to do that is going to take a bit of experimenting. Watch your first batch carefully and note how long it took in a recipe book or on a recipe card. When you take the cookie sheets out of the oven, don’t take the cookies off immediately. 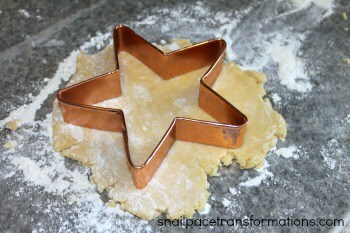 This leads to a lot of broken and warped cookies. Instead let them cool on the sheets three to four minutes and then transfer to a cooling rack that is lined with wax paper so they don’t melt around the wire. Tiny spatula for tiny cookies, medium spatula for medium cookies and a large giant BBQ spatula for giant cookies. This leads to less breakage and warping. Let the cookies become 100% cool before you box them up or ice them. If you box them warm, they will stick together. If you ice them warm, the icing melts and slides right off the cookie. Sugar cookies don’t keep more than a few day, so bless another family with a plate full. 20 years ago my sugar cookies tasted either like rubber or like cardboard. 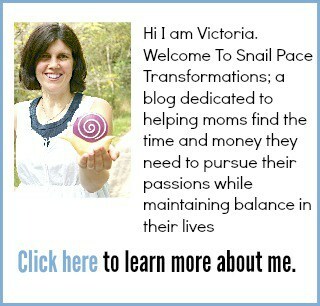 About ten years ago they started becoming the thing I am known for. People flock to my husband come Christmas time to see if sugar cookies are in his lunch. Moms sneak extras into their pockets at our annual Christmas cookie party. So don’t be too hard on yourself if they flop the first time or the second or third time, learn from your flop and keep trying. Here is the recipe we use to ice our cookies with. It isn’t the type that gets hard, so you can’t stack your sugar cookies, but it is super easy to make and around our home–the cookies never last long enough to stack. If you are making sugar cookies with children, THROW MOST OF THIS LIST OUT! I make my sugar cookies in the early morning hours before the kids are up, it is therapy to me. Later when they are cooled I let them decorate them however they want. When she was younger, my daughter would occasionally help me bake a batch and when she did I would start off our cookie session with the attitude of “building memories is more important than building perfect sugar cookies.” I still used real ingredients, but I was not as fussy on the looks of the cookie. I want a cookie!!!!! Right now!!!!! Oh ya! I was suppose to send some home with your daughter. Sorry. Don’t worry I am making several more batches this season. I love making sugar cookies and it looks like you like yours like I do–not one bit burnt, but soft and chewy. And I learned something new today. I never realized that lining the pan with parchment would keep them from getting dark bottoms. Thanks! And I agree with your other tips too. I’ve learned many of these by trial and error.